Every year the world generates millions of tons of e-waste, which are electronic and electric equipment (EEE) that are trashed. This is a massive environmental problem brought on by the hyper consumption of laptops, smartphones, and similar devices in a throw-away culture. Less than half of e-waste ends up in landfills, and those unaccounted for are most likely discarded and unused within many households and manufacturing sites. To date, more and more industries are jumping on board to recycle e-waste because these trashed gadgets are found to contain precious metals and plastics in them that can be recovered and recycled. Recycling e-waste needs to be pursued more strongly, as only about 20% are recycled. However, new research has found that some recycled e-waste products pose significant health risks for people when used in consumer products. Black plastics for instance, are used in manufacturing everyday household items. There is a high demand for black plastic because of its durability and appearance, and it is a common material used in utensils, stirrers, lids, food containers, and even children’s toys. Since black plastic itself is not recyclable, the demand for black plastic is sourced from e-waste. Most EEE devices are black (except refrigerators and washers), so it would seem that these items are a perfect option to get black plastic. However, these plastics often have additives that are used to increase their durability and insulation properties. And according to a UK study conducted by Dr. Andrew Turner, it was found that recycled black plastics used in consumer goods have high levels of toxic chemicals like antimony, lead, mercury and bromine. 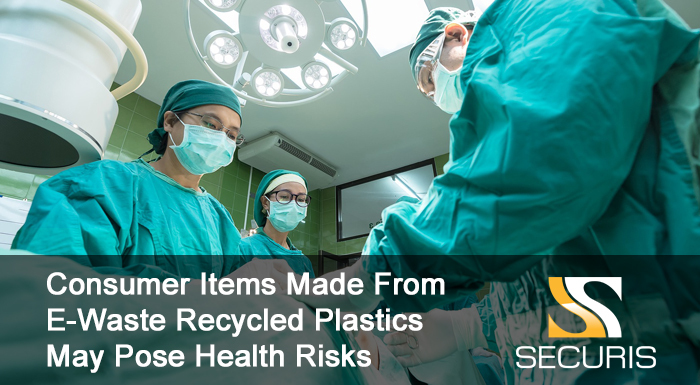 The University of Plymouth research team used X-ray fluorescence spectroscopy to determine the levels of certain toxins in black plastic products. Over 600 products were tested with the X-ray analysis, categorized according to use (e.g. food contact items, toys, clothing, jewelry, etc). The analysis determined that bromine – a flame-retardant element – was present in almost half of the black plastic goods, while lead and antimony were found in one fourth of the products tested. Lead was, in fact, most common among toys and clothing while it was least found in the food contact category. Dr. Turner was adamant that while black plastic may be appealing for consumer items, their study proves that recycled plastic from e-waste introduces harmful chemicals into household products. He further mentioned that the public would definitely find this result both unexpected and unsavory, and that the findings warrant more comprehensive studies. Even though there are stricter regulations involved in recycling of e-waste due to their hazardous substances, many are still able to exploit them. Companies for instance, can label e-waste as ‘repairable’ or ‘reusable’ instead of ‘hazardous waste’. Of course, there are many opportunities to repair, reuse and remanufacture old electronic devices. But some companies can also use the provision to use e-waste in ways that are harmful to human health, i.e. for food packaging and related items. How these potentially hazardous chemicals end up in consumer items, especially food contact goods, is a strong indication that there is a problem with the global policies and regulations established for e-waste recycling. Plastics recovered from e-waste should undergo proper disassembly and treatment for them to be free of hazardous materials. But inferior recycling practices has “resulted in such a wide and uncontrolled dispersion of contaminants,” the researchers claimed. More informed regulations and more effective recycling systems should be put in place to prevent illegal dumping and improper treatment of e-waste. Dr. Turner asserts that there needs to be more innovative practices and tech within the recycling industry to make sure that the harmful substances are eliminated during the treatment process, making black plastics more fit for consumer products. Indeed, developing the technology to effectively recycle black plastics is a long-term process, so the research team recommends that virgin-mined black plastic be used for production of daily household items. Recycled black plastics meanwhile, should only be limited to products that have minimal human contact. Until such time that recycling facilities and processes worldwide can ensure that e-waste recycled black plastics are completely safe, it pays to err on the side of caution. Contact us now to find out how we can help you safely dispose of your e-waste.